Contemporary African Art is difficult to categorize just as singularly defining 'art' in the 21st Century is virtually impossible. In fact, most art directors, curators and historians would today be extremely hesitant to commit to such a definition. Contemporary Art is, by its very nature, fluid, self-motivated and resists classification. Contemporary African Art particularly cannot be generalized and reduced to a singular concept simply by the fact that there are many art scenes happening all over Africa and each is fuelled by its own contextual parameters. What does it mean and who is 'African', just who does one include? An indigenous African artist who lives and works on home territory is an obvious starting point, but what about those that travel between two worlds? Or even those who have never put a foot in Africa but their heritage is African and their work is inspired by and reflective of this legacy? And what about those white Africans who come from European stock one, two or even three centuries ago? Do they have as much claim to be included in the framework as their black counterparts? Afropolitanism is the voguish term for new work made by young African artists both in and outside Africa. The artists are presumably united by some shared view of Africa but this seems preposterous given that their cultures are widely varied, their geographical locations scattered, their personal stories and journeys vastly disparate. I, like Holland Cotter of the New York Times, choose to defend an artist's right not to 'wrap themselves in evidence of their origins'. Their work will demonstrate, up to that point of creativity, a personal reflection of everything that has defined them and contributed to their mode of existence. Their 'Africanness' of contemporary African art may, or may not be perceptible or relevant to the subject matter but it is inherent in their nature and therefore their work. Contemporary is about the now; belonging to or occurring in the present. If we describe someone as a modernist we recognize that they have achieved a significant departure from traditional styles or values. These artists have pushed boundaries at many stages of their careers and most of them still continue to do so. They are valued today for not only their contribution to aesthetic and cultural history but they were also often involved in international discourses on evaluating modernity in contemporary African art on the continent of Africa and mediating its place on the world art scene. It is important to acknowledge that African men and women chose to master the new technologies presented to them and used them within their own local frameworks to contribute to a budding modernity on the continent. 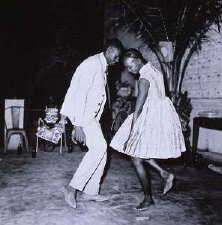 The true African Modernists were real protagonists as they sought to maintain cultural responsibility and expression under the constraints of colonialism. African modernities were very often enclosed within resistance movements which had given birth at the same time as the infliction of colonial rule. Some of these movements such as the sign painting of Nigeria grew in force and courage revealing themes of subjugated humiliation as the decades progressed. 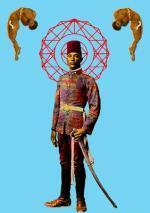 Colonialism introduced a whole new world of ideas and artistic disciplines to contemporary African art within Africa. Art schools and technological colleges, workshops and studios were set up by the colonial regimes introducing new artistic disciplines like easel painting and photography. Representational art took over from idealization and the traditional language of African creative and spiritual expression. This was ironically happening at the same time as Europe and the Western world were absorbing the reverberations of the dynamic shift of Picasso and his contemporaries into cubism and the liberation of line, shape, colour and form. Since 1910, art had no longer been purely visual but was now conceptual and societal as well. Some of these African modernists like Mancoba and Sekoto escaped the confines of their imposed cultures and went to London or Paris where they were exposed to Western art and all its history including the impressionists, post-impressionists and the developing avant garde. In Paris, Enwonwu was exposed to 'Negritude', a black affirmation movement and this gave his work a sophistication way above his counterparts at home. However, despite long sojourns away, they returned to their countries of birth to embrace new directions and the influences of political and social changes on the continent and to strive for world recognition of the existence of an African modernism within contemporary African art. 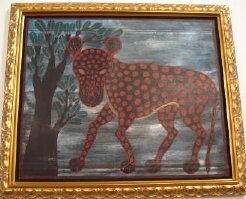 Artistic activities in Africa during colonial times fell into two areas, those that were defined by direct Western influence such as in Schools of Art and craft workshops set up by the colonial governments and sometimes well-meaning, paternalistic individuals wishing to make a mark in Africa. South Africa, Rorke's Drift's artists produced strong graphic prints under direction from Swedish missionaries, Polly Street Art Centre, Johannesburg. By 1980 most African countries had achieved independence from their foreign governing regimes. South Africa was the last country to achieve black rule and they rocketed into a new era, starved of true freedom of expression but due to their sophisticated education systems, technically ahead of the pack. Conceptual art had been slow to arrive in Africa and in the 80's abstract painting was still being taught. This gap narrowed considerably with the great political changes experienced and new and exciting imaginations prospered. New contemporary African art forms appeared consistently as Africa embraced globalization, being exposed to the media, having enhanced communication and insight into other cultures. The opportunity to travel became broader and many African artists elected to spend time away from their homelands, embracing a larger world of influences and inspirations. At the same time African artists left on the continent looked squarely at their feet, and their surroundings to make strong statements on the impact of globalization on their continent; nowhere else on the planet has become so inventive in creating sculptures, installations and craft made from recycled found objects. In this capacity, I believe African artists have created a truly unique art form and have bequeathed a new art context to the world. 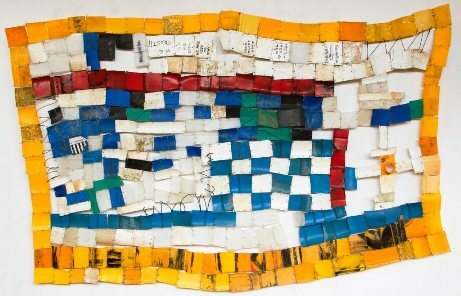 Serge Attukwai Clottey, b 1985, Accra, Ghana cuts up small squares of plastic from the myriad of plastic containers that are strewn around Ghana, mostly used in a secondary capacity for fetching water. They are essentially plastic tapestries that also incorporate other found objects. 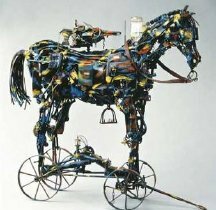 Willie Bester, b 1956, South Africa has been creating assemblage pieces for years and can certainly be judged the forefather of this media. He is socially and politically driven to make powerful pieces that demand recognition despite, or in some cases because of, the materials he has used to construct his installations and sculptures. Sign-art, sign writing, poster making, Ghana and DRC. There have been a number of exhibitions in recent times that have been paramount to establishing contemporary African art on the Western art front. 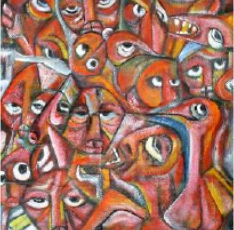 1984, MOMA Exhibition, New York - 'Primitivism in 20th C Art' Widely criticized for promoting African art as primitive and non secular while its Western counterparts were seen as 'modern', it nonetheless brought attention to the beauty of form thus exhibited. 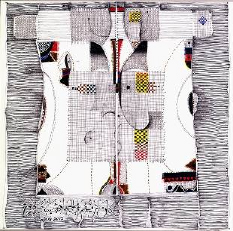 1989, Centre Pompidou, Paris - 'Magicians de la Terre', this exhibition teamed primitive or folk artist like Kane Kwei with the so-called avant-garde. This exhibition revealed more about the curator than the reality of the artistic scene on the African continent as preference was given to artists who exhibited traces of tradition like feathers, pigments etc. However it did bring some unexposed African artists into the limelight and showed them alongside others from all over the world placing them in a very contemporary context which was a first. 1995, Whitechapel, London 'Seven Stories about Modern Art in Africa', attempted to provide an historical context for African modernism. Showed the work of 60 artists and the collaboration of 5 African curators. 2001, New York City - 'The Short Century: Independence and Liberation movements in Africa, 1945-1994', highly ambitious it installed 400 works on 3 floors of all media forms from all over Africa. 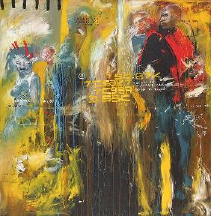 2001, Barcelona - 'The Artist and the City' After the millennium, there is a gradual inclusion of African artists in global forums like the Venice Biennale. 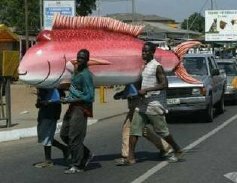 2004, 'Africa Remix' - conceptualized by Simon Njami, Cameroon. 2005, exhibition showed in Southbank, London with 25 countries represented by 60 artists, some resident in Africa and others part of the diaspora. 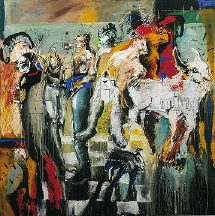 2006, Johannesburg Art Gallery, showed 200 pieces by 87 artists. 2008, October gallery, London - 'Angaza Africa', showcased their choice of 12 of Africa's most innovative and dynamic artists. 2008, Studio Museum, Harlem - 'Flow' - focused on a new generation of young artists who mostly live abroad and visit Africa regularly.